Advanced Gauging Technologies, LLC, Plain City, OH, introduces the AGT800 laser thickness gauge—an online noncontact device equipped to measure any strip material 0.040 to 0.750 in. thick. The first production system, say company officials, went to a 96- by 0.750-in. Butech stretch leveler-CTL line that shipped in mid-September 2013. The thickness gauge and its accompanying SPC reporting system is designed to measure the thickness of metal alloys and any other materials processed in coil, sheet or strip form. 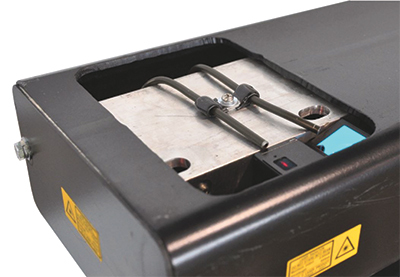 Two Keyence laser sensors mount above and below the strip; laser-triangulation technology provides quick, accurate and reliable thickness measurements. SPC reports include a graphic representation of strip thickness over the coil length, with indications locating out-of-tolerance material; a defect-summary report describing each defect type and its respective location in the coil; and a system-setup report. Benefits include documented compliance with ISO 9002 and QS 9000 requirements, in addition to improved process control, increased productivity and scrap reduction. See also: Advanced Gauging Technologies, L.L.C.